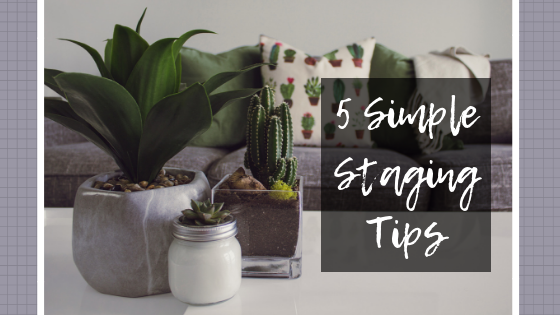 Don’t get nervous, staging doesn’t have to be a big ordeal. There are some simple things you can do to showcase your home that will increase the likelihood of a top-dollar offer. Read the pointers below and feel free to reach out if there’s anything our team can do to help! A little lighting, some fresh flowers, and white linens go a long way in making a home look more attractive to buyers. Set the stage to give buyers the warm fuzzies. . . . Lighting is everything, and often, it is a great low-cost solution that can bring plenty of gains. The best way to improve lighting is to add floor lamps and table lamps. Of course, this must be done strategically. Too many lamps, and you’ll be headed for disaster. Herline Goutama of Let’s Stage It said, “Something as simple as a floor lamp can illuminate a dark corner or ceiling and completely change the space in the process.” She advises that there should be three sources of light in every room. “The key is to create subtle variances of light levels, which accentuate surfaces and make the room feel more spacious,” Goutama said. If you are anything like me, this feels totally wrong and unnatural, but the wall is not your friend. Instead of depending on the wall as a guide, float your furniture, even in the least expected places. This method not only makes the space easier to navigate, but it also helps it appear larger. The goal is for buyers to be able to explore the home without being overwhelmed by the furniture. Margaret Schaffer of Restyle Home recommends using the home’s traffic pattern to guide you. “Furniture should never be a distraction, but rather a way to enhance the natural flow of the house,” she said. Fresh flowers are a basic crowd pleaser. These simple additions lend vibrancy, beauty and aroma to any room. Bouquets can be used as centerpieces in the kitchen or dining table, and smaller arrangements can be placed on side tables. Even a few small stems in a mason jar can offer a welcoming touch. You aren’t selling a home, you are selling the life. It’s all about the feeling that someone gets when they walk through the door. Ideally, prospective buyers will feel right at home, and make offers to match. To make them feel this way, you have to show them what life in the home will be like. That means creating moments they can connect to — without it feeling contrived. “A cozy reading nook in a living room or a collection of glass jars on a tray in the master bath creates a sense of both luxury and comfort,” Schaffer said. Looking for a way to create a spa-like atmosphere without breaking the bank? Goutama said it’s as easy as using white linens in the master bathroom. “Thick white towels and shower curtains can transform a bathroom from frumpy to luxury spa,” Goutama said. To take this to the next level, roll a few bath towels and place them on the tub, and do the same with hand towels near the sink. You can also add baskets of scented soaps, tub accessories, candles and a vase of lavender or an orchid. Voila, you have an oasis. Goutama also advises not to neglect the master bedroom. “A clean, voluminous cotton duvet cover and white pillows adds a pleasant hotel look,” Goutama said. Granted, it takes more than just five tips to create an irresistible home, but it’s a start.